We're always hoping to inspire more people to get into homesteading & gardening.. so here's a great opportunity for all of you to win some seriously awesome homesteading items! We are giving away two really great books to help you get started with growing your own food right in your backyard & begin canning! Right here, we're giving away Mini Farming: Self Sufficiency on 1/4 Acre AND Food in Jars: Preserving in Small Batches Year Round. Join us along with 16 other blogs for this amazing giveaway! There's gardening items, canning supplies, helpful kitchen tools and homesteading books galore. You don't want to miss this! Each blog is giving away it's own prizes, so make sure to visit each one to maximize your chances. See what each blog is giving away & learn how to enter below! 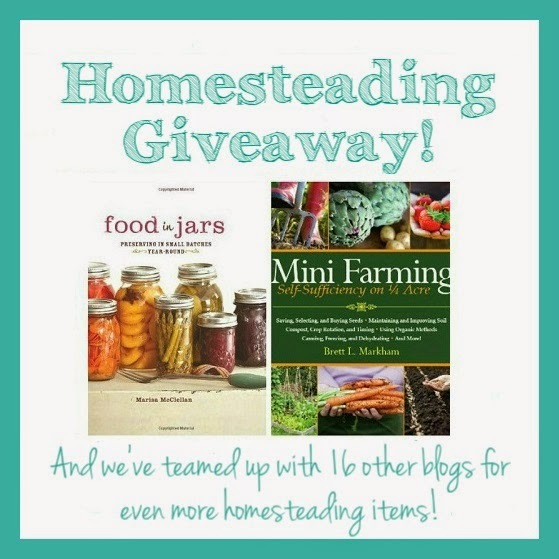 Be sure to visit the other blogs co-hosting this giveaway for chances to win ALL of the other awesome books & homestead items! 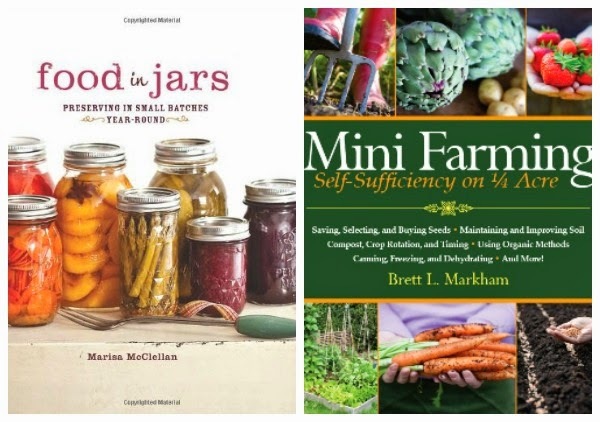 Blue Yurt Farms - Two awesome gardening books! Eat Play Love More - Great stainless steel containers! Ever Growing Farm - Two awesome books from Root Simple! Faulk Farmstead - Two great inspiring homestead books! Green Eggs and Goats - Two super useful homestead books! Grow a Good Life - Great kitchen scale, perfect for canning! ImaginAcres - The perfect start to your herbal tea garden! The Jahner Farmstead - Canning supplies! Learning and Yearning - Amazing enrichment products for your garden! Little Big Harvest - Amazing mandoline slicer and grater! Reformation Acres - Super useful immersion blender, your choice of color! The Toups Address - Lodge pre-seasoned grill pan, perfect for all kinds of meals! This Organic Life - A bundle of great sustainability products! Timber Creek Farm - Pewter & sterling homesteader charm bracelet, handmade in the US! Whistle Pig Hollow - A handy stoneware grease keeper (perfect for bacon grease)! Winterstead - Beginners guide to homemade holistic health and beauty! Mini Farming: Self Sufficiency on a 1/4 Acre. 1. Subscribe to the Linn Acres Farm Newsletter by entering your email below. 2. Head on down to the Rafflecopter widget below to confirm your entries and unlock opportunities to gain additional entries. Make sure to visit all of the above blogs for all of the other great items! The winner will be chosen via random.org. This giveaway ends at 11:59 PM on Monday, June 9th, 2014. The winner will be contacted by email, and will have 48 hours to respond with his/her full name, address, and phone number. There is no purchase necessary to win. This giveaway is open to US residents only! this is a lovely giveaway!! I love growing both tomatoes and peppers. Such a variety available when you grow your own! I have been wanting Food In Jars since it came out! Thank you! I love growing zucchini just because the plant makes so much and I can cook it so many different ways. I have tried gardening on and off through out my adult life. We just moved to our homestead last August and it is our fist "we need this to grow garden":) . Tomatoes and peppers are my favorite since they are 2 of my favorites to cook and or eat! Yes, I have a garden. My favorite thing to grow is tomatoes. My Favorite veggie to grow would have to be the tomato, so versatile..can eat it red or green! I also love red beets, super easy to grow! Great giveaway, Thank you for this opportunity!! I don't have a garden YET, but plan on starting one very soon. I plan on growing everything I can! Thanks for hosting this giveaway!! I love to garden and am learning to can so this would be an excellent book combo for me! I have just started my garden. I would especially love to grow my own herbs. This is my first year trying to garden in the heat of southern Arizona, I have my fingers crossed that several medicinal herbs, beets and zucchini will do well, since these are my favorite! Potatoes! Thanks for the opportunity! I have a mostly brown thumb. I can use all the help I can get! i love growing herbs. they are easy, fragrant, and fun! I have an herb garden and my oregano is going wild! I have a garden, but favorites are hard to choose! Love having a mixed greens bed for daily salads, and fresh herbs change everything :-). Tomatoes, herbs, cucumbers, beans...all my favs! I don't have a garden yet. Can I say my favorite thing to grow is chickens? Yes I have a garden. I like growing tomatoes. I like growing tomatoes, and I don't even like to eat them! I have started to like homemade roasted tomato sauce. Love canning. Trying to become more self sufficient. These books would be very helpful. First year growing beets...love eating their greens,have to plant more next time. I do have a garden! This year is my first organic garden and it's been a lot of learning. My favorite thing to grow (so far) is tomatoes or radish. Can hardly wait for our first ripe tomato! Am currently growing in a small area(by choice) to see just how productive I can be. Love to can as well so I know the books will be helpful! My favorite thing to grow is tomatoes! I love growing heirloom winter squash! Awesme books! I absolutely love tomatoes and my garden is full of four different types pink brandywines are my favorite to eat fresh but have lots of canning types also. we dont this year! just our 'salad bowl' and some potted herbs because we're moving but i typically love doing squashes and beans! Yes, I do have a garden. I love to grow squash. We do have a garden. My favorite is tomatoes & garlic, but my husband's is potatoes. My garden right now is a dozen seedlings- each basil and cilantro! Hitting the market this coming weekend for more plants! I just put mini farming on my amazon wish list! My favorite veggie to grow is lettuce! YES!! herbs are my favorite!